Once nearly eliminated in North Carolina, beavers have returned to most of the state's watersheds through 50 years of restocking. Beavers are unique in their ability to modify the environment for their own needs by constructing sturdy dams of sticks, leaves, and mud. Although beavers are negatively viewed in some situations due to the flooding and girdling of trees, their presence may ultimately be beneficial. This publication reviews benefits of beavers and methods to manage and enhance beaver ponds. Beavers typically construct a series of dams to raise water levels to access food sources safely by swimming instead of walking. Most beavers depend on their ponds as places to meet all living, food, and protection needs. Beaver ponds range in size from less than one acre to well over 100 acres, depending on the topography of the bottomland and the availability of food sources. Beavers will use and expand a pond area until the food supplies are exhausted, usually up to 10 years or more. After abandoning a pond site, beavers move into other areas and establish new living sites, leaving the old pond to silt in and eventually return to its original forested state. Beaver ponds provide a wide array of benefits. See Houses for Wood Ducks for details on erecting wood duck boxes and Bats for ways to encourage bats in beaver pond habitats. Enhance beaver pond benefits by using a drainage system to manage the level of the pond. Inexpensive, effective drainage systems can be built using logs, PVC, or aluminum irrigation pipe. 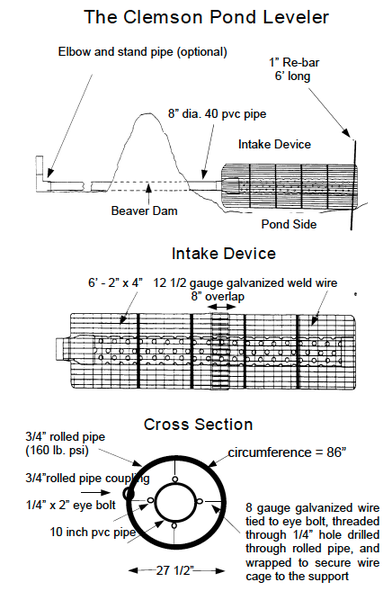 The Clemson Beaver Pond Leveler (Figure 1) can be made with PVC pipe, mesh wire, and an elbow joint. The Clemson Leveler is effective because its intake device is positioned beneath the water and is caged to ensure drainage even if blocked by debris or dam materials. The addition of an elbow and stand pipe allows for easy water level manipulation. Break the dam on the downhill side of the existing channel in the form of a narrow, deep "V." The initial flow of water through the dam will help clear excess dam materials. Place the drain pipe deep into the break so that at least 10 feet of pipe extends into the upstream area. The final level of the pond will be determined by the height of the downstream end of the pipe, or the stand pipe position height. Drive a metal stake into the end of the cage to secure it. The 10 inch drain pipe is perforated with 2 inch holes prior to being encircled by galvanized weldwire fencing. Install more than one drain per dam on larger ponds or to accommodate for high water events. Check beaver pond drains at least once a month to insure that the desired water levels are maintained. Always leave at least 1⁄3 to 1⁄2 of the pond area undrained during drawdown, as overdraining may cause the beavers to seek new areas. Drain ponds to a level of 1 to 2 feet annually to promote natural emergent vegetation and productive moist-soil areas. Create "greentree reservoirs" for waterfowl by drawing beaver ponds down during the growing season from March to September; remove drains and allow water to stand from November through February when the trees are dormant to provide feeding and resting areas for wintering ducks. Introduce beneficial aquatic plants such as duckweed and watermeal to new or refilled beaver ponds. Broadcast Japanese millet in moist areas at a rate of 25 pounds per acre beginning in late June or July. Plant by July 15 in the mountains and as late as August 14 in the coastal plain. Remove the pond drain 45-50 days after seeding to allow the pond to refill and flood the mature millet for waterfowl. Fertilizer is usually unnecessary for the first 2 years. Install wood duck boxes, with predator guards, to supply and improve nesting and brooding-rearing habitat in beaver ponds. Delay pond drawdowns until after July 1 in ponds with nesting wood ducks. Figure 1. Clemson Pond Leveler. “Clemson Beaver Pond Leveler”: Clemson University, Department of Aquaculture, Fisheries, and Wildlife, AFW Leaflet #1, Dec. 1991. Beavers. Bromley, P. and others. Wildlife Damage Management, N.C.Cooperative Extension. AG 472-4, Oct. 1994.